Gone are the days when a watch used to be a necessity. A time has come where now it is more of a status symbol and equipment of luxury than it was originally intended. There are now various global brands and designers who come out with the most expensive and radically-designed watches, especially for men. The gold watch is one of the most popular watch types in men and is worn for their practicality as well as their opulence. 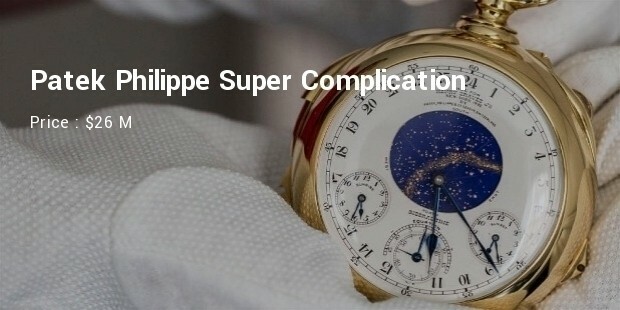 The Patek Philippe Super Complication is by far the most expensive gold watch on record with a cost of around $26 million. This 18-karat gold pocket-watch was designed by Patek Philippe for banker Henry Graves Jr. in 1933. This hand-crafted piece of beauty took an astounding 5 years to design and make. It is equipped with 24 complications (mechanical features beyond simple timekeeping) including a chronograph with various functions for every hour of the day. It also holds the distinction of being the most complicated watch ever created as well as being the most expensive watch auctioned till date. 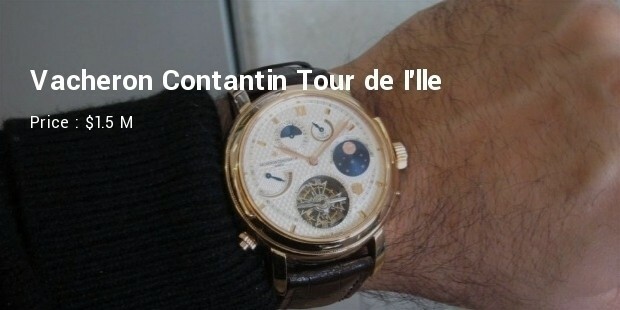 The Tour de I’lle by Swiss watchmaker Vacheron Constantin is a complicated wrist watch priced at an expensive $1.5 million. It was made to commemorate the company’s 250th founding anniversary. This 18 K gold watch includes a blue sapphire non-reflective glass with double-face. The jaw-dropping timepiece from luxury watchmakers Hublot was released as a limited edition in 2009. 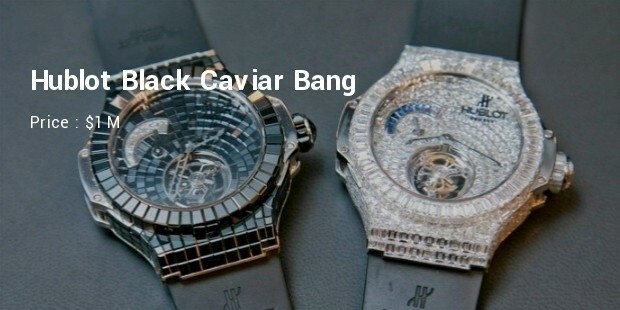 Priced at a hefty $1 million, the Black Caviar Bang is covered with around 501 baguette-cut pure black diamonds on an 18-karat gold body. 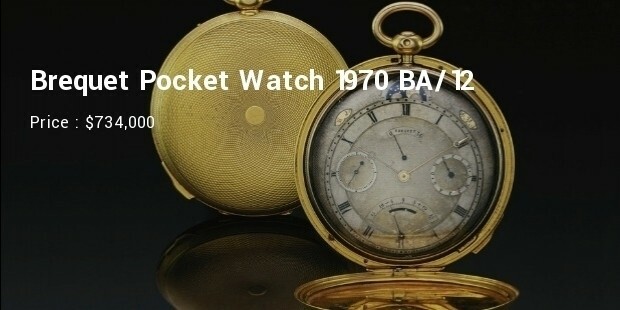 The Brequet Pocket Watch 1970 is priced at an exceptional $734,000. This is an 18 K gold pocket-watch that includes hand engraving designs and features including silver dial with intricate workmanship. 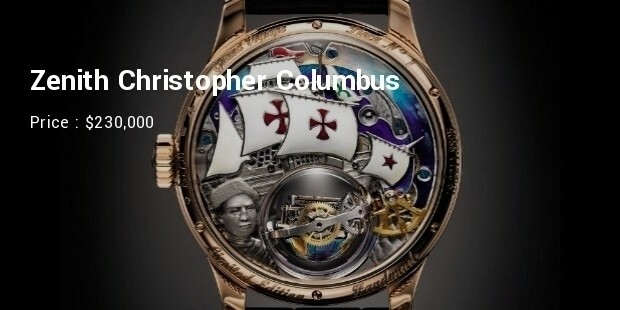 The Zenith Christopher Columbus Cross is priced at around $230,000 and is part of a limited-edition series. This gold watch comes with a comprehensive navigational compass inside a glass bubble. It is sleek unique and truly classy with a refreshing design. 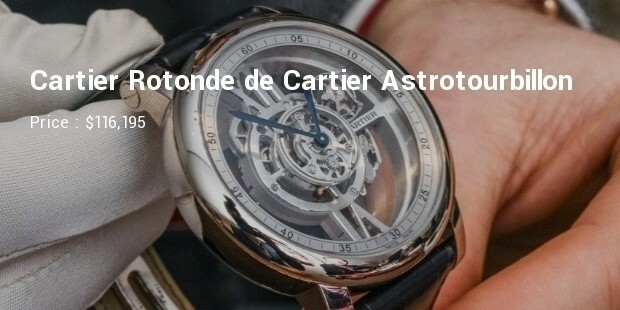 The Rotonde de Cartier Astrotourbillon by Cartier is priced at around $116,195 and was one of the most popular watches when released initially as well. This gold watch has many innovative features including an intricately designed second hand that gives it a unique beauty. 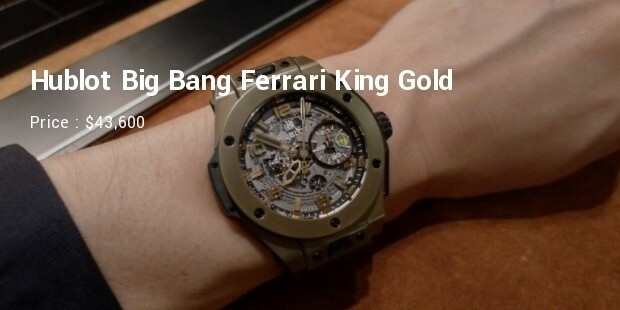 The Hublot Big Bang Ferrari King Gold is a truly unique watch. This completely customizable luxury from the house of Hublot is priced at around $43,600 as it allows you to choose how you want your watch to look. This includes a choice of materials and designs for the case, strap, dial, strap material, color, etc. 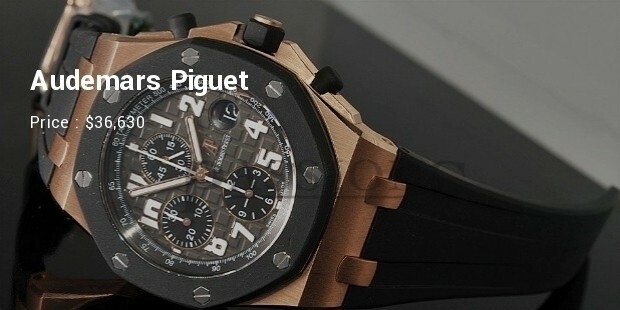 Innovators of the trend of using more rubber in luxury watches, the Audemars Piguet Royal Oak Offshore Rubber Clad is priced at around $36,630. This 18 K gold watch has a 3-dial system telling hours, minutes and seconds with unmatched precision. 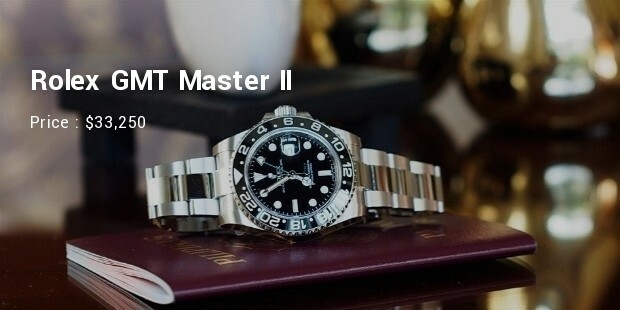 The Rolex GMT Master II is priced at around $33,250 and comes with an option of 18 K white/yellow gold case. Apart from the case made from precious metal, this Rolex also comes with various precious gems such as diamonds, rubies and sapphires inlaid in its body. 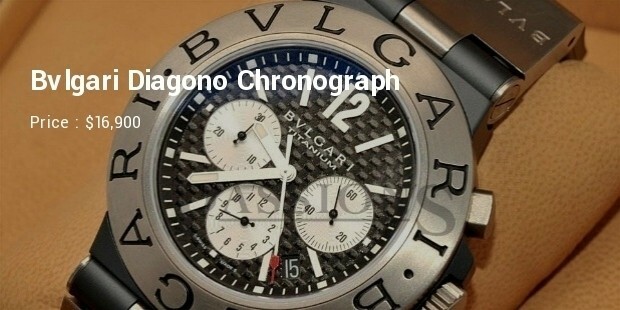 The luxury house of Bvlgari presents the Diagono Chronograph, priced at an expensive $16,900. This unique watch is most popular among artists and musicians. It has a scratch-proof crystal face, rubberized black bezel along with stainless steel links and a strap made from a highly-durable rubber. All of these expensive watches have been designed and crafted by some of the world’s most experienced and renowned watchmakers. These watches are not simple timekeeping devices but are also a large statement of fashion and style.